Arden Termite and Pest Control provides a complete line of services for termite inspections and pest control in the greater Sacramento area. Alert: Bed bugs are infesting more and more apartments, hotels, motels and homes in the Sacramento area. If you or your tenants are finding strange insect bites or skin rashes, you may have bed bugs. Call us today to schedule an inspection and if needed, a discreet treatment. Your neighbors will never know! This is termite swarm season. Winged termites can suddenly appear inside your home. You will often find them on window sills and near other light sources. While they look like flying ants, they are most likely termites here in the Sacramento area. Call us immediately to schedule a free inspection to be sure. Save a sample insect in a plastic baggie. Spray the rest with Raid or some other household pesticide. It won't kill the termite colony but it will slow them down until we can treat your home with Termidor, the most effective guaranteed termite treatment. If you see mud tubes on your foundation or while remodeling or cleaning the garage, it means you have termites! No matter how old your home is, where it's located, or how it's constructed, it is susceptible to being attacked by termites. Every year they cause billions of dollars of damage in the United States alone - damage that homeowners insurance won't cover. Chances are you will never see evidence of termites or termite damage until it's too late. 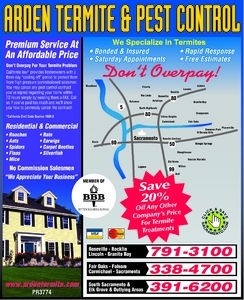 We offer a 20% discount off the written estimate of any other pest control company's bid or current contract for subterranean termite treatments. We perform termite inspections, treatments and fumigations for the control of subterranean termites, drywood termites, wood boring beetles and other wood destroying pests. We perform termite inspections and certifications for real estate transactions. We recommend Termidor for subterranean termite control. We recommend Vikane for fumigating houses for drywood termites. We recommend Timbor as an alternative to fumigating houses. Termites are social insects that live in large colonies. There are three groups of individuals or castes: reproductives, workers, and soldiers. Termites digest cellulose in wood with the aid of special micro-organisms within their digestive system. The workers prefer to feed on fungus-infected wood but readily feed on undamaged wood as well. The foraging workers feed immature workers, reproductives, and soldiers with food materials from their mouths and anuses. Subterranean termite colonies are established by winged reproductives which, depending on the species, swarm (winged reproductives: kings and queens  fly out of the colony) from spring through the summer. A male and female that have swarmed from an established colony lose their wings and seek a dark cavity inside where they mate and raise the first group of workers. Both of these reproductives feed on wood, tend the eggs, and build the initial nest. Upon maturation, the workers expand the colony and feed the reproductives. In some species, as the colony becomes larger, supplementary reproductives are produced to lay eggs that become workers. The soldiers, who multiply as the colony increases in size, are responsible for repelling invading ants and other predators.